This delicious winter story starts with the Romans in the 2nd century, where we have the first records of wine being heated and enriched with spices. 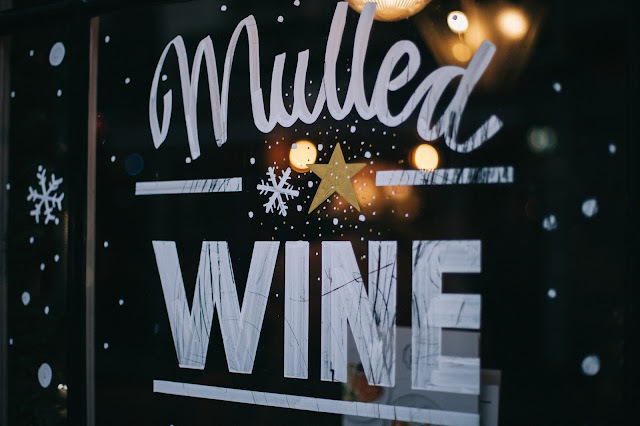 Luckily for us, Roman legions traveled all across Europe, conquering and trading, so mulled wine reached basically all parts of the old continent by the 14th and 15th century. However, today many nationalities and cultures all over the world enjoy this winter delicacy, as each and every country has its own recipe and variations. If you want to stay warm and cozy this winter and wet your whistle with something aromatic and sweet, here’s a mulled wine recipe for you. So even if you’re a total wine beginner (a quick wine guide just for you) and don’t know your way around the kitchen, you’ll be able to make your own perfect cup. This recipe is perfect for a party or a family Christmas gathering since it serves ten people. Of course, you can use only half of the ingredients if you’re having a smaller event, or cook just a quarter if you’re planning to have a romantic evening by the fireplace with your partner. Anyway, here’s what you need for a big batch. The first thing you need to do is choose your wine. Your best choice would be a wine with a relatively high alcohol content and a fruity aroma. These sturdy wines will not succumb to the heat and lose all alcohol and aromas. Red wines from warmer climates like Italy or Australia should be perfect for this recipe. Of course, you don’t have to go all the way to The Land Down Under to get some high-quality Aussie wine. Some people prefer to buy wines online and wait until they come knocking at their door. Now we’re coming to the tricky (but fun) part—cooking the wine! First, you can take your fruit and peel your clementines, lemon and lime with a speed-peeler. Don’t peel directly into the trash can, you’ll need the peel. Then, grab a big saucepan, add the sugar and peel from your fruit and give your clementines a squeeze until all the juice is in the pan. Put everything over a medium heat. Go ahead and add your spices—cloves, cinnamon, bay leaves, cardamom and 10 to 15 gratings of nutmeg, and add the inside of half of a vanilla pod. Then add just enough wine to cover the sugar and stir. Let the mixture simmer slowly until the sugar dissolves, then bring it to a boil and keep it there for 4-5 minutes or until the mixture turns into a thick syrup. The reason why you’re making the syrup first is to better infuse the spices and get the best possible aroma. In order for the ingredients to mix, you need to reach a boiling point, and if you try this with a lot of wine, all the alcohol would burn off. Once you have your syrup, you can lower the heat and add the rest of your wine, water and anise. Stir the mixture occasionally, and once it’s nice and warm, get ready to serve it. Just make sure not to overheat the wine! 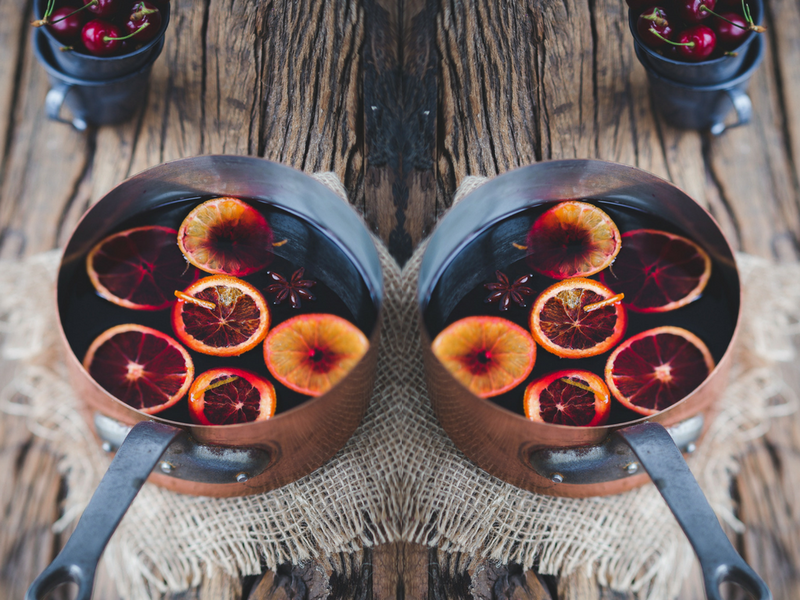 Since your mulled wine will be pretty hot, prepare some heatproof glasses or mugs and pour the content with a ladle. Garnish your creation with a cinnamon stick, a slice of orange or drop in a few cherries or other berries. 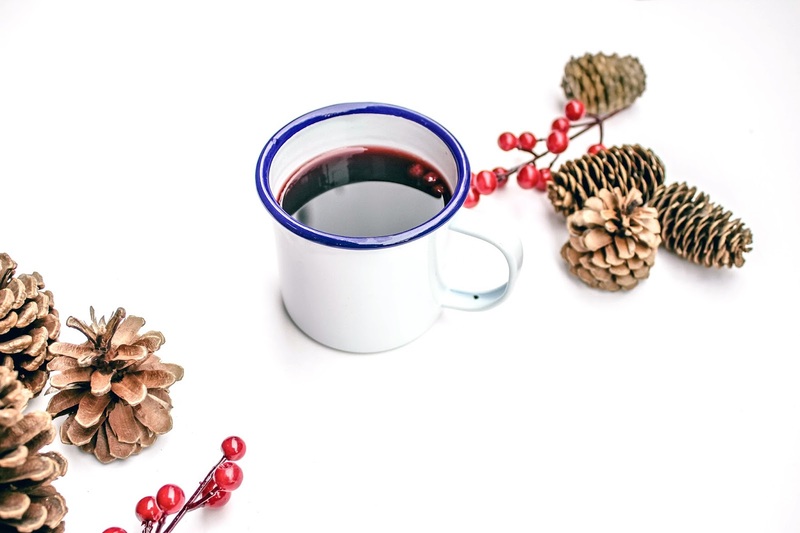 Once you have a hot mug of mulled wine in your hand, you’re ready to face the cold winter nights with a smile on your face. Give it a try this holiday season!